Avid quilters love to find new ways to put their skills to use. Finding ways to use up leftover batting and charms can be an added perk as well. Jenny Doan from the Missouri Star Quilt Company has created a great tote bag made from charms. You can make your own 5-inch charms from fabric, or you can purchase pre-cut charms from places like Fat Quarter Shop, Keepsake Quilting, or the Missouri Star Quilt Company. The charm packs tend to come with 42 squares to a pack, so with one pack, you can make three totes; each tote takes only 12 charms. For full instructions on how to make these handy bags, watch Doan's tutorial below. Besides the 12 5x5-inch squares, you will also need a little less than a yard of contrasting fabric and some batting. Doan points out that you can make your tote as large as you want by simply adding extra charms. The key to getting the bottom the right size is to make it seven inches by the width of your bag. Once your charms and bottom are sewn together, you will place it on top of a piece of batting and stitch it on. You can free quilt lines through the charms, securing them to the batting and giving the bag a "quilted" look. 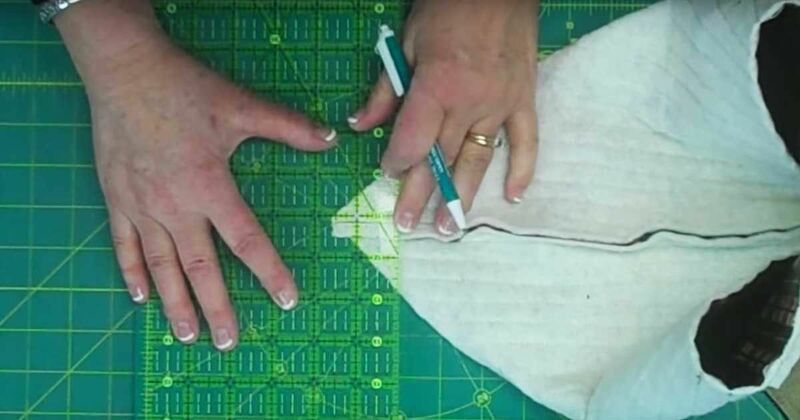 Once you're done, trim the excess batting off and lay your quilted bag over your contrasting fabric for the liner. Cut the liner the exact same size as the bag. You can then start stitching your bag. The key to getting your bag to stand nicely is boxing the corners. Doan walks you through the process in the video. In order to turn the bag, she reminds you to leave an opening in the edge of the liner. Once the bag is fully assembled, you can stitch the opening closed by hand or with the sewing machine. If you've used a charm pack for your tote, you can make three out of one pack. They can be perfect for carrying music, books or baby supplies. With so many possibilities, they're absolutely "charming."